The NP-100v12 is a simple headphone amplifier that allows an entry level builder to experience assembling and listening to their own creation. I use the term builder as electronic experience combined with innovation which allows the creation of a device, rather than simple board stuffing. 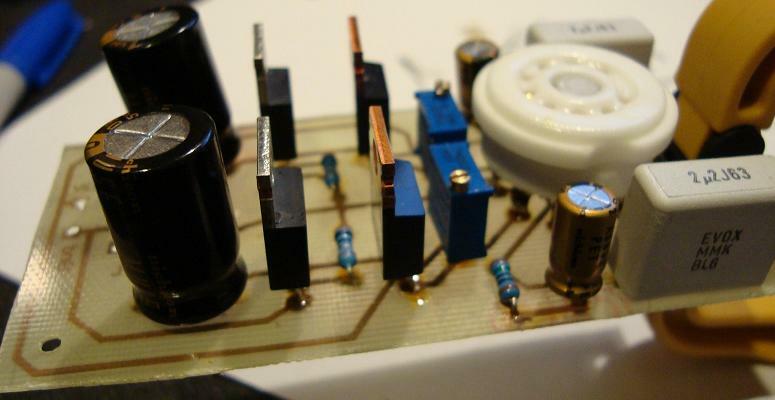 This amplifier can take on many shapes and sizes; I especially like when builders reuse older devices as cases and even recycle some components from various discarded power supplies. I try to keep price at a minimum because this amplifier is very basic and allows the builder to seek out theory, and actually "listen" to their music, and grow to build more complex projects in the future. There are plenty of wonderful websites out there that can explain tube theory, I learned from the US Navy NEETS module 6. I will not go to in depth into the theory, but will introduce you to the 12AU7 (known in Europe as ECC82). 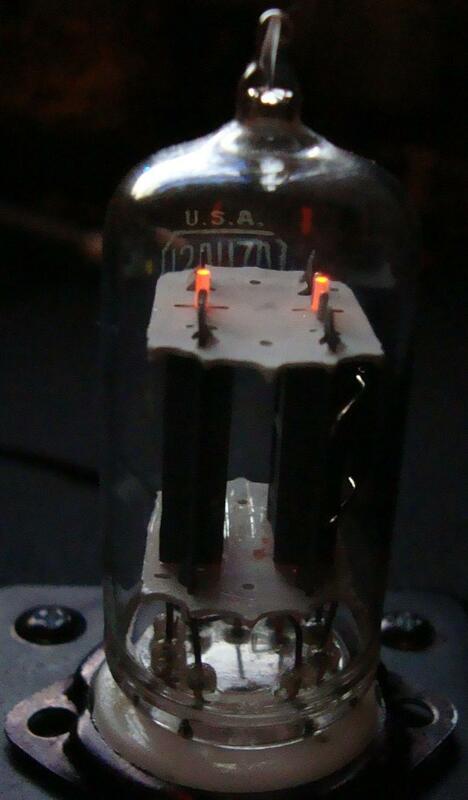 The 12AU7 (ECC82) is a Twin Triode vacuum tube, it is very popular in the audio world because it is rather rugged and can be operated at lower voltages. You will find these tubes in vintage amplifiers and organs. They are even used in older vacuum tube volt meters and their life span can reach into decades. The 12AU7 has an amplification factor (µ) of about 17, this is moderate as compared to its cousin the 12AX7 that comes in at 100. 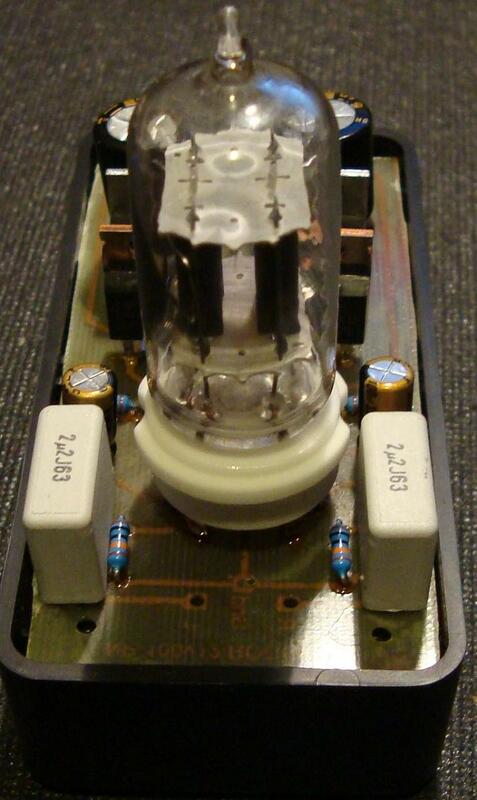 For purpose of the NP-100v12 the 12AU7 tube will be used in a common cathode configuration, and the incoming signal will be amplified by approximately 10dB. The 12AU7 is usually operated at plate voltages of over 120 volts, but fortunately it can be operated at lower voltages with decent results. As you see in the load lone graph below, we will operate in the 6 volt region. 6 volts allows enough "swing" for the signal to reach 12 volts and down to the 0 volt line. Since this amplifier is single-ended we will not be applying an external negative voltage, but due to grid leak bias the voltage does sit above common. 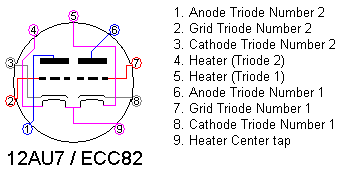 The tube has 9 pins and follows the EIA 9A pin out configuration. Remember that pin out diagrams are always read from the bottom of the tube, this little detail may save you much rework in the future. The great thing about this tube - it is basically two tubes in one. The other plus is that the heaters (filaments) can be powered by 6.3 or 12.6 volts AC or DC. In lower voltage amps, using DC for the heaters is preferred to reduce hum. For the NP-100v12 we will be using a 12 volt sealed lead acid (SLA) battery as the power supply (hence v12). 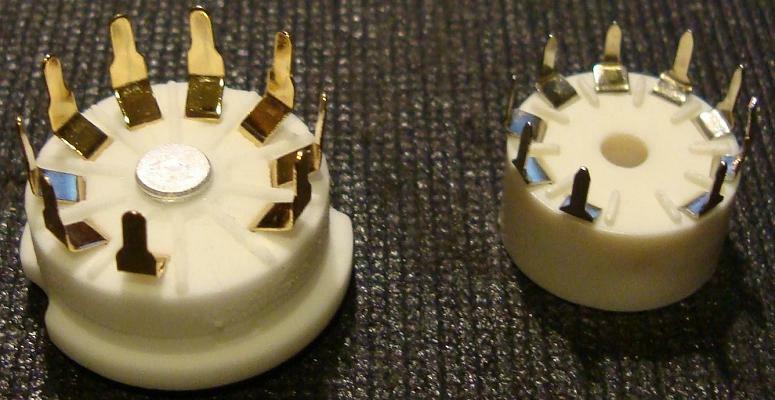 The two filaments are pinned 4 to 9 and 9 to 5, with pin 9 as a center tap. One can apply 12.6 volts across pins 4 and 5, or 6.3 volts to pins 4 and 5 with pin 9 used for common (negative), or 6.3 volts can be applied to pin 9 with pins 4 and 5 used as common. The power supply is rather simple and straightforward, a 12v SLA battery. The battery is rated at 1.3 ampere-hour (Ah) and the total amplifier draw is about 400 mA, so we can expect some hours of playback between charges. A battery is the perfect source for voltage as there is no ripple or noise that will be injected into the signal, this is very important with headphone applications. An alternate is a regulated switch mode power supply. I use a Cannon K30120 13v 1.8A portable printer power supply. The voltage is kept constant, great filtering, and most of all there is a built in over current protect. These power supplies can easily be found in thrift stores, the cost is miniscule to building a similar supply. It is important that the power supply be regulated to keep the unwanted noise levels low. The circuit consists of two stages: 1. a common cathode tube volt amp stage (gain), 2. a MOSFET source follower for current gain (with a LM317 voltage regulator IC configured as a constant current source). 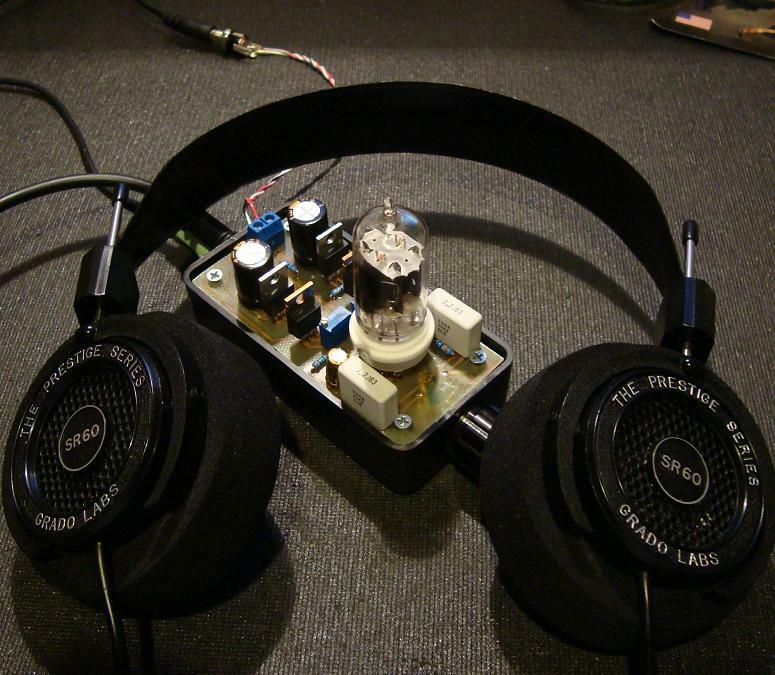 Since most headphones are less than 50 ohms a little current is necessary to run them efficiently. A Bipolar Junction Transistor (BJT) can be used in place of the MOSFET, but MOSFETs tend to be more stable with temperature and current shifts. Use caution when handling MOSFETs as they are very static sensitive. The signal enters the grid via a coupling capacitor, it leaves the plate (anode) amplified and 180 degrees out of phase, it is then directly coupled to the gate of the MOSFET and leaves the source. 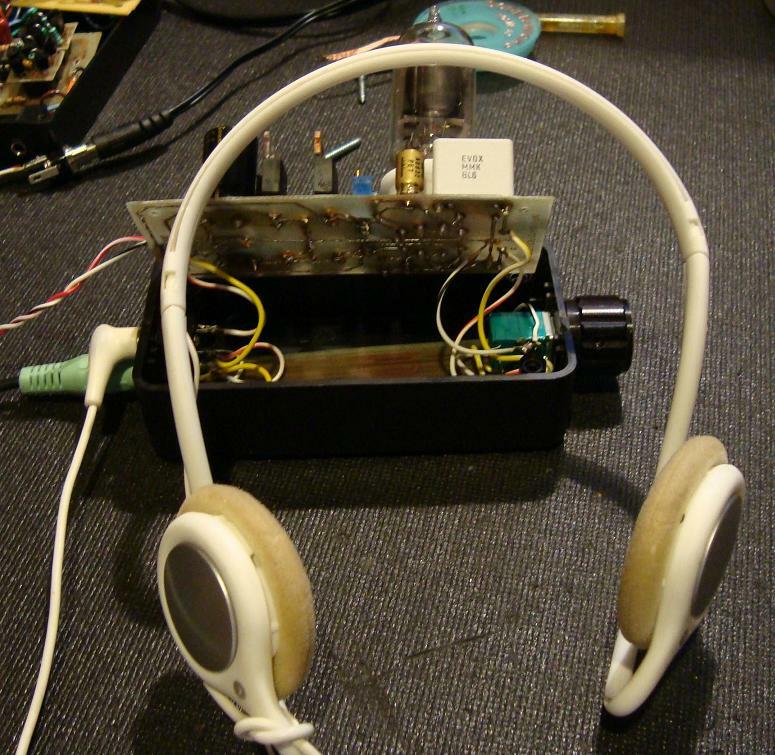 The signal is then coupled to the headphones via a electrolytic capacitor, which blocks the DC from your headphones. Since the sleeve of your headphones is common it completes the circuit. The MOSFET is biased into class-A operation and will be constantly conducting at approximately 125 mA. The LM317 regulator is configured as a constant current source and regulates at 125 mA in the given configuration. You can use the online LM317 current regulator calculator to determine the current through the regulator by adjusting the program resistor. It is suggested that a 10 ohm 1/2W program resistors is used for R4 (you can use two 1/4W 20 ohm resistors in parallel). 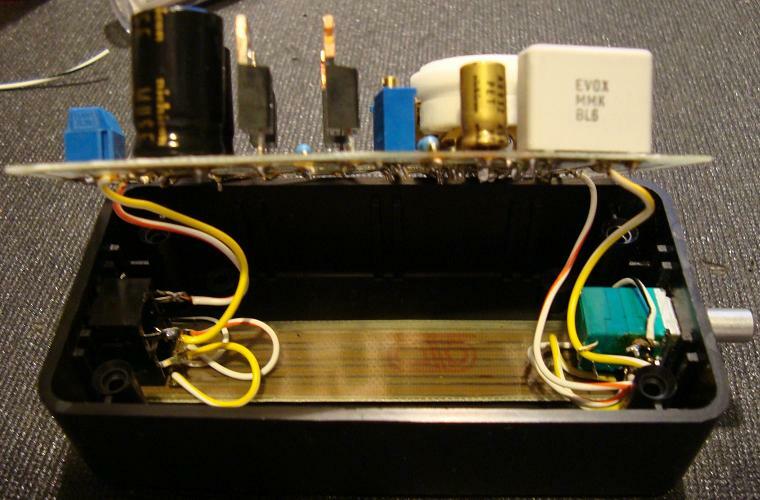 Note that the regulator and MOSFET devices will heat up and radiate heat. There are some real in depth calculations for heat, but know that the MOSFET can dissipate at least 1.6 Watts and the LM317 voltage regulator IC 2 Watts to air, at room temp. I tested a prototype over a continuous 24 hours period in a 150 cubic-centimeter (about 9 cubic-inch) enclosure and there were no thermal stability issues. You can add heatsinks to the devices, just ensure that if you gang the FETs together to use mica and silicone washers to prevent the 12V supply from transferring to the heat sinks. The schematic above shows only one channel, you will have to wire the the tube for both channels using different pins. 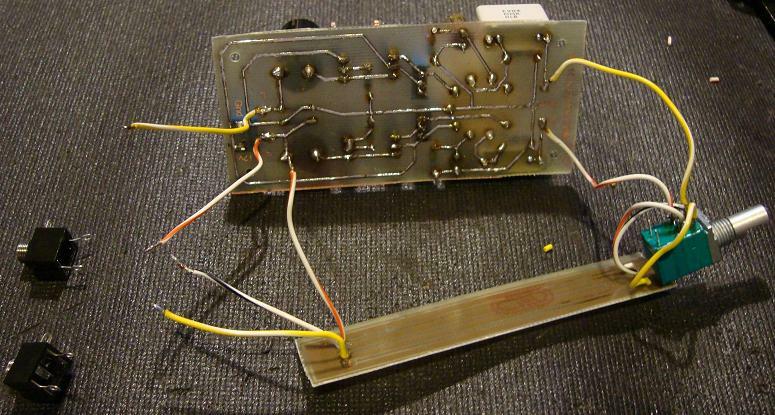 The only wiring that is common for the 12AU7 tube between the two channels is the heater. With any project there are specialized tools that are required; in this project you will need some basic electronic test equipment and tools. 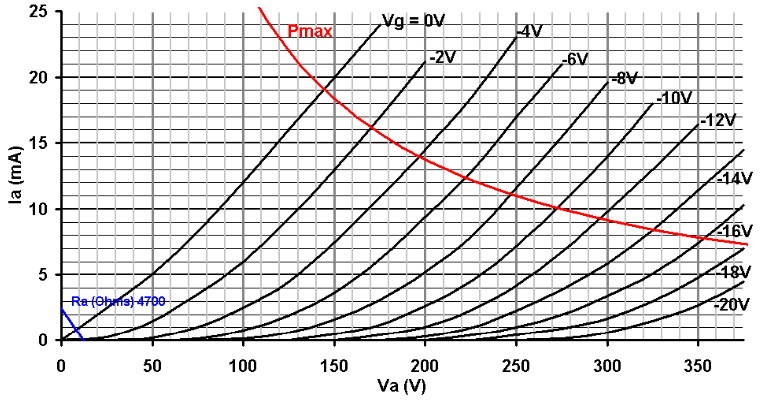 Ohm's Law deals with three basic measurements, Voltage, Resistance and Current. Knowing at least two of the variables, we can extrapolate a multitude of others. To make good readings, one must use a digital multimeter (DMM or DVOM). There are hundreds of DMMs on the market and you do not need to spend $200 on a DMM if you are only doing hobby work, but try to stay away from the very cheap $10 knock offs. One should use a meter that reads all three parameters and have probes that are safe up to 1000 volts. The second most important tool is the soldering iron. 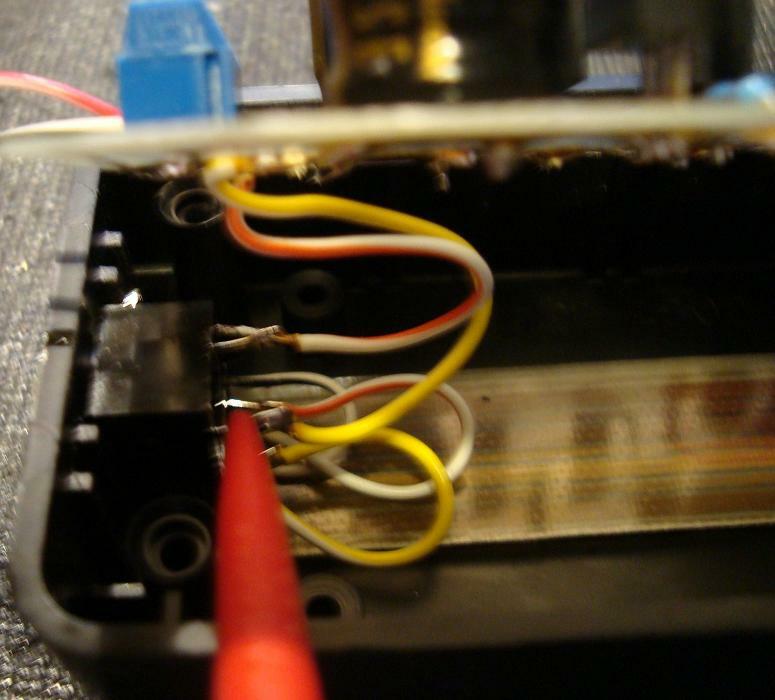 You can use a soldering pencil, but for best results, a soldering station equivalent to the Weller WLC100 will save you headaches down the line. Nothing like leaving your soldering pencil on the table and finding it with your arm, or burning your laptop, etc.. Rosin core 60/40 solder is the best for new builders, there are others who swear by silver solder and other fancy solder, but for this application, the 60/40 flows well and will last years. Lastly purchase some liquid flux in a needle type applicator. Flux helps to transfer the heat to the joint, and will make the job so much easier. The solder has a flux core, but again the job will go much better with flux. Cleaning of the flux can be done with an acid brush and 99% isopropyl alcohol; you do not have to go crazy with cleaning, as the low voltage will not be an issue. Stay away from plumbing flux, it is conductive and can destroy your project. Purchase some cheap headphones for troubleshooting. Similar to the ones you use on the airplane, nothing like frying your $300 Sennheiser headphones to make a project go upside down. The bill of materials (BOM) is pretty straightforward, I selected readily available parts, 90% of them can be purchased at Radio Shack. If you have access to similar components, or you want to buy higher quality components, you can use Nichicon FG, KZ or Elna electrolytic capacitors and maybe Solen polypropylene film for C1. The only issue is shipping charges can make the project expensive, if you use a local Guitar Center and Radio Shack you can cut out shipping costs completely. 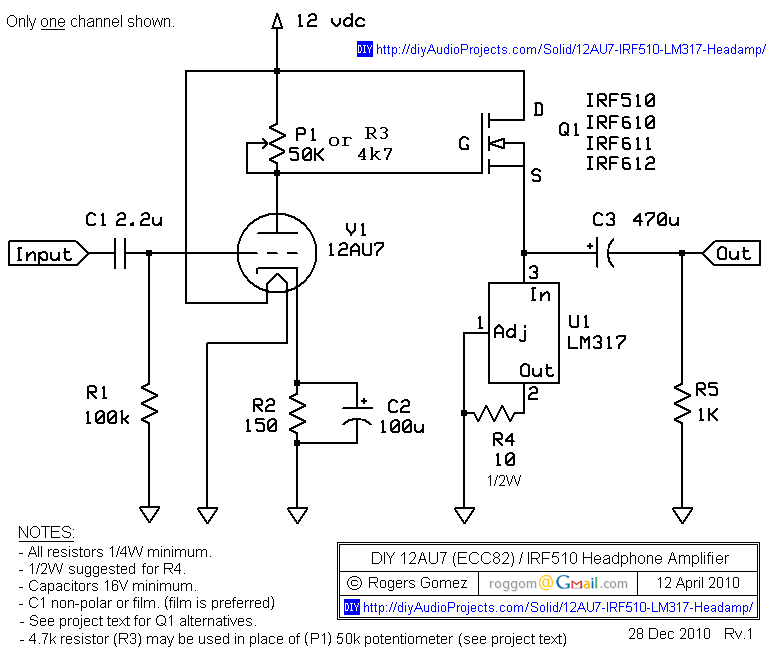 The BOM for this 12AU7 (ECC82) / IRF510 Headphone Amp is provided in Table 1. 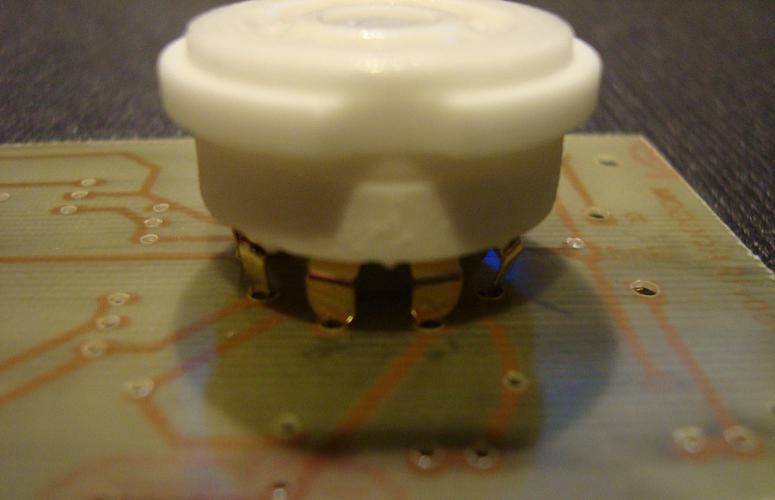 R3 - A fixed resistor (R3) may be used in place of the 50k potentiometer (P1). 4k7 worked for many 12AU7 tube types, but you should pick a value to get half the supply voltage (see setting the bias Photograph 14). C1 - Non-polarized electrolytic or film type capacitors may be used for C1 (2.2uF or greater). 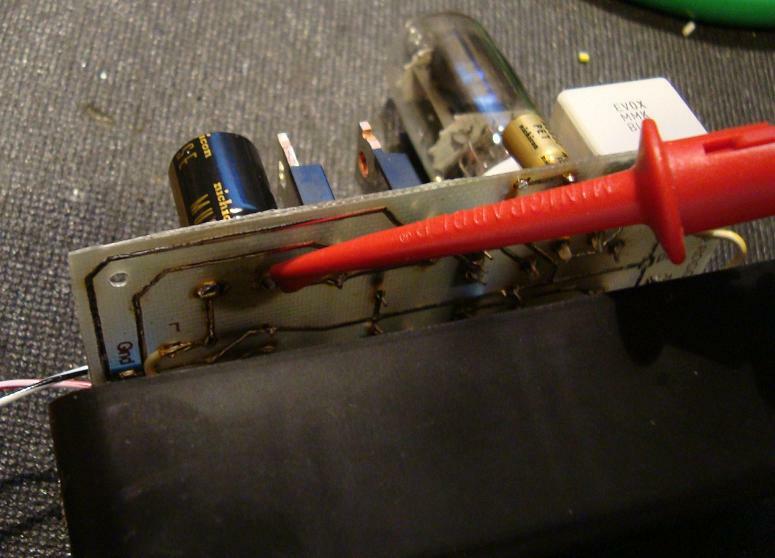 Most will find that a film type capacitor will sound best. Generic Polyester or Polypropylene types work well. HEATSINKS - As previously noted, it is completely fine to run the MOSFETS and LM317 regulators to air, I did the math from the datasheets and the current is low enough to keep them stable. However, please do note that they do get hot. The metal tabs will sizzle water from your finger tip, like checking a clothes iron, but have not had a failure yet. There is not too much radiant heat though. If you are worried about heat you can use a small heat sink on the devices. After a few years the circuit has been modified from my original 12AU7 Tube / IRF612 MOSFET Hybrid Headphone Amplifier build to fit on a single layer printed circuit board (PCB). 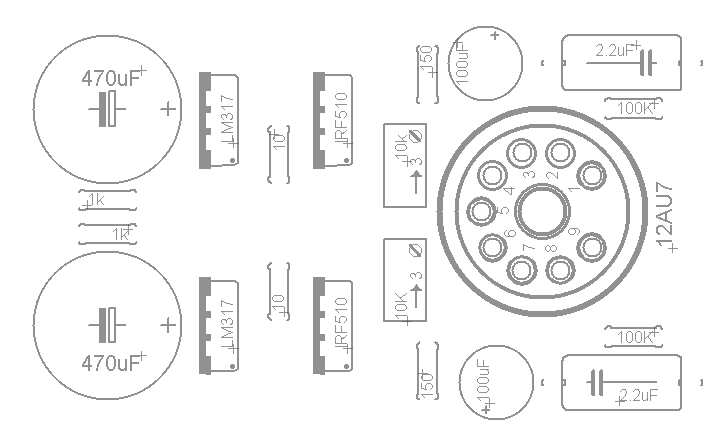 Although it can easily be constructed point-to-point on a 750 hole proto board, a PCB is a cost effective upgrade. There are several sites that give in depth instructions on etching a PCB at home, and the whole process can be very rewarding. Just know that etching utilizes some very caustic and nasty chemicals, so proper ventilation and use of personal protective equipment (PPE) will make the process easy, fun and safe. Muriatic acid and hydrogen peroxide yielded the best results and also is much cheaper than ferric chloride. The board layouts are included in the attachments; you can print them out and etch them using the toner transfer method. I used the free version of the CADSOFT Eagle program to construct the board on a single plane. The process is done with a standard Toner Transfer method. Basically print the trace design onto cheap glossy photo paper. You must use a laser printer, or a Xerox copier on the darkest setting possible. The dark setting will allow the most toner to build up on the paper. Follow one of the many instruction set found online, I found the glossy magazine transfer method the best and easiest. You will have a transfer, just touch up and then finish the etching process. Another key note is to have a dremel press, or use two hands when drilling holes. Use the smallest bit possible then move up in size. If you remove too much copper, it will make the process of soldering cumbersome. After many modifications the PCB was reduced to a 2-1/4" x 4-3/4" and then down to 2" x 4" (50 x 100 mm) with thicker traces. The build is demonstrated on the first version (slightly larger PCB). The components are fed through the top of the PCB and soldered onto the bottom (copper side). There are several types of 9 pin sockets, some will fit better than others, but with a little diligence either socket will work fine. Solder in the tube socket, the pins will fit in the hole pattern, just use caution not to overstress the pins or they will break. Solder the resistors next, the PCB spacing is for 1/4 watt metal film types, if you only have 1/2 watt or higher resistors, you will have to bend the leads to fit the PCB. After populating resistors, solder in the capacitors. The C1 capacitors are polyester film types (non-polar) and can be placed in either direction. 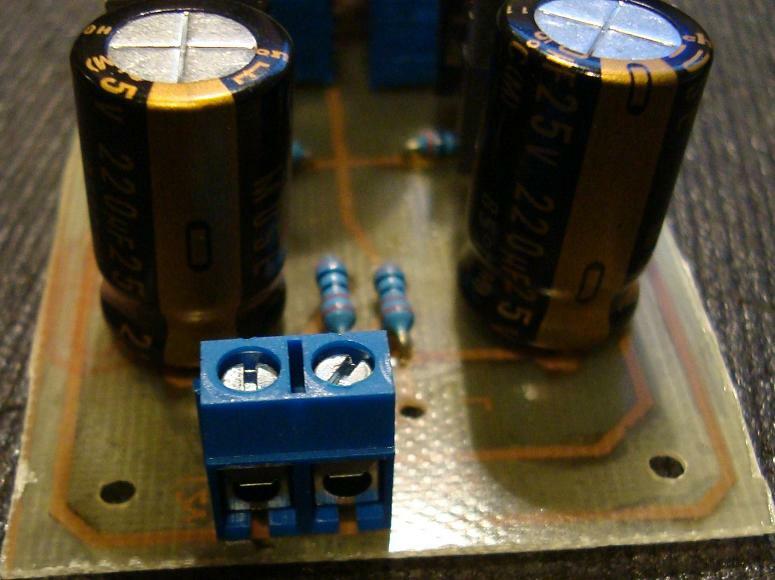 The remaining capacitors are electrolytic, and must follow proper polarity. C2 has the ground pin facing the tube, and C3 have the ground pin facing back. Solder the MOSFETS, LM317voltage regulators, and the remaining components. Solder in the power jack, which in this case is a terminal block. If you prefer, you can run wires to a jack on the enclosure. 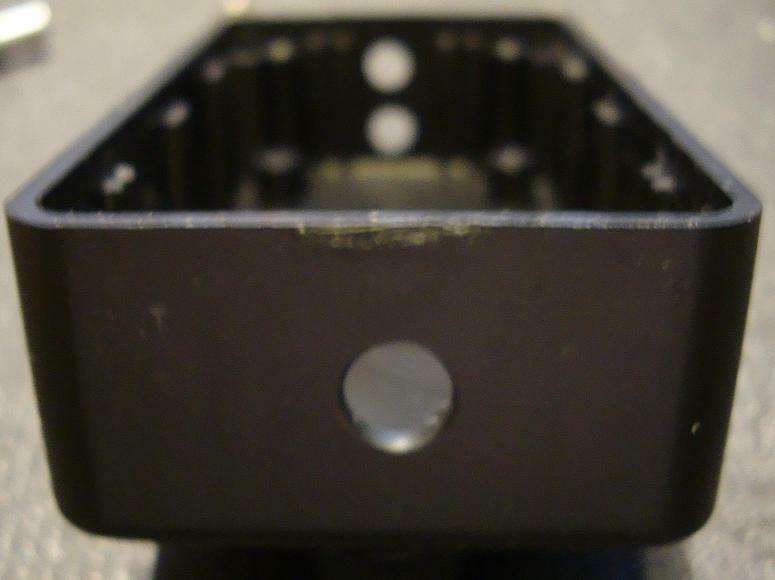 Test fit the PCB into the enclosure and trim the sides as necessary. With the board complete, prepare the case for the sockets and volume potentiometer. A stepped drill bit works great for drilling the holes into the enclosure. I have drafted a routing PCB (see the previous PCB section), but three small gauge wires will work fine too. Solder all connections before mounting. 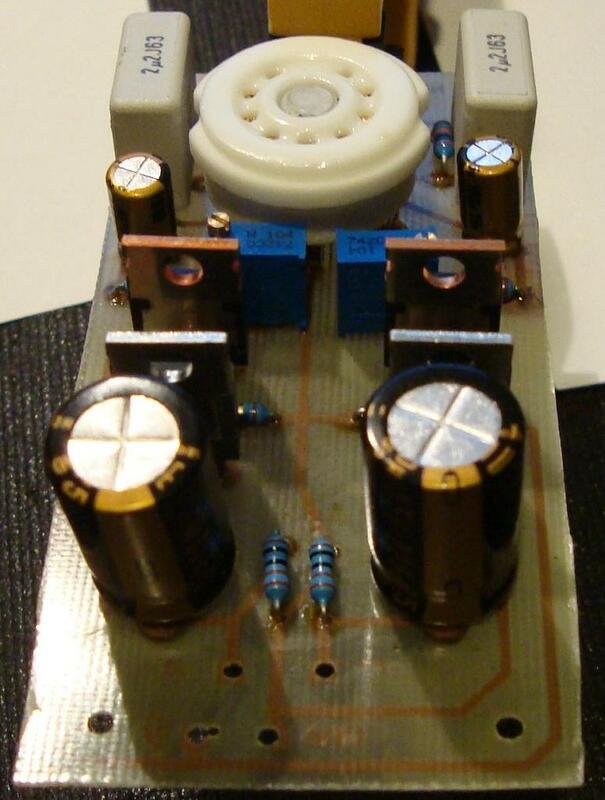 Mount the jacks and potentiometer and leave the amp board free for testing. The positive lead from C3 is the same potential as the MOSFET source pin. It is best to check voltage at the capacitor, because the MOSFET can be damaged if the pins are shorted. Also, check that both heaters glow. The bias is set by adjusting the 50k trim potemtiometer (P1) until the output side of the MOSFET (Source) is at one-half of the supply voltage (Drain). Adjusting the two trim potemtiometers to one-half of your supply voltage, 6 volts since we are using a 12v supply. You will want to check and reset the bias a few times in the first few hours of use as it will drift while everything settles in. Next check for DC offset at the headphone output using a DMM. The DC offset should be less than 10 mV. After a number of prototypes I measured 8 mV max and typically about 3 mV. Now its time to hook up the cheap phones for a quick listen. If all is good, secure the amp to the case, one more check with the cheap headphones, then try out your new amp. Now its time for tube rolling. Enjoy! If you have any questions, feel free to ask them in the 12AU7 / IRF510 HeadAmp Support Thread in the message forum.